RUSH: Let’s go to the White House Rose Garden today. 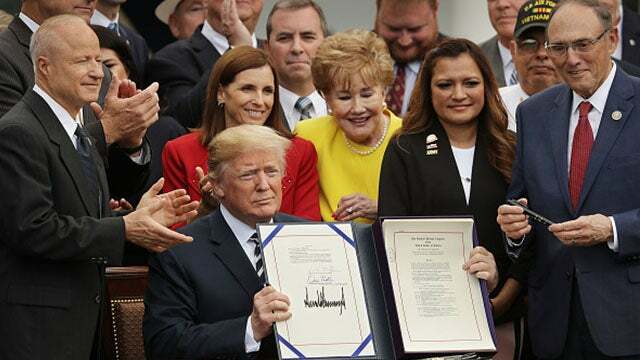 Signing ceremony for the VA Mission Act of 2018. This provides mandatory funding for the Veterans Choice Program. THE PRESIDENT: This is truly a historic moment, historic time for our country. I’ll be signing landmark legislation to provide health care choice. What a beautiful word that is, “choice.” And freedom to our amazing veterans. I want to welcome every veteran. We have many veterans here today, every caregiver and service member who has joined us on this very momentous occasion. All during the campaign I’d go out and say, “Why can’t they just go see a doctor instead of standing in line for weeks and weeks and weeks?” Now they can go see a doctor. RUSH: So he just continues to improve things throughout the country while the little Chihuahuas are nipping at his ankles. Also in the Rose Garden we have another little sound bite from the president starting his midterm campaigning. THE PRESIDENT: We have an election coming on November 6th. They said it would be very, very slow, this period of time, and I was just telling Mike, “You know, Mike, this hasn’t been very slow.” If you look, we passed Dodd-Frank, Right to Try, we just got $700 billion for our military. On December 22nd, we signed the biggest tax cuts in the history of our country. That’s a big one. And we got $1.6 billion, we’ve already started the wall on the southern border. RUSH: So progress keeps moving forward in the Trump administration, and the Drive-By Media is not talking about any of this. They’re focused on Melania, they’re focused on Russia, and they’re focused on the Philadelphia Eagles not showing up.